What’s happening on the backstage? A 2007 research study of 600 white students from 28 colleges and universities across the U.S. revealed that while racist behaviors and comments appear to have lessened in settings where races were mixed, they are plentiful in white-only settings. The researchers called this the backstage. Picca and Feagin had the students keep race diaries for 6-8 weeks noting any encounter or conversation where race was mentioned. Out of 9,000 total entries, about 6,000 were blatently racist comments and behaviors by white family, friends, and strangers. Most occurred in white-only settings and slurs, jokes, and hateful comments were directed towards people from multiple races and ethnicities other than white. Some students joined in with the racist behavior; others spoke out against it. There was a significant group of students who knew what they were observing was wrong, but they didn’t know how to respond. Disrupting the silence that allows racism to perpetuate itself is a moral duty. Learning how to speak up is a critical responsibility. For too long, I was one of the silent ones, thinking I had to have the perfect response. Now I understand that an imperfect response is better than saying nothing. 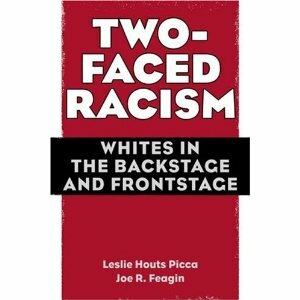 What’s your backstage like and how is your bystander behavior contributing to racial equity? It’s a question I have to ask myself everyday to keep me honest.